Amazon! They market things they want you to buy, like books, Prime subscriptions, and sauté pans. They do this well, because you probably buy things from Amazon, or know someone who does. They also now actively market their artificial intelligence-powered facial recognition software, Rekognition, for use in police surveillance. And yes, they also this well, too. Documents obtained by the American Civil Liberties Union (ACLU) reveal that Amazon has been working with governments and police departments to build up advanced surveillance systems in a number of counties and states. While Rekognition has been used by police in Washington County, Oregon to search for suspects for the past year and a half, according to Amazon, the newly-released documents reveal the extent to which mass surveillance programs are being developed with Amazon’s cooperation. These programs can include using all the cameras already found around a city to give police information on the activity of any “person of interest” as they appear on screen. They could even involve building Rekognition software into the body cameras that police allegedly wear to increase transparency and public accountability (even though the cameras tend to mysteriously malfunction at inopportune moments). Amazon Rekognition is capable of scanning video feeds and images for up to a hundred faces at once. Rekognition can find, identify, and track people in real time, and was recently used for a cute-yet-ethically-dubious “who’s who?” broadcast of the recent royal wedding. As the ACLU argued today in their letter to Amazon CEO Jeff Bezos, who touts his company as being exceptionally “customer-centric,” encouraging and even allowing police to use such advanced surveillance technology undermines people’s rights and primes police-work for abuse. In particular, the ACLU is concerned that police would use these tools to target political groups or people who are otherwise vulnerable. 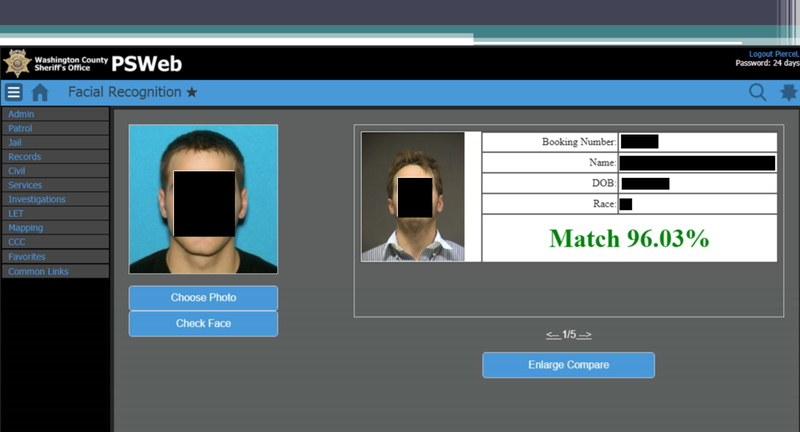 Some of the documents obtained by the ACLU show the user interface for the facial recognition software. Police will be able to upload any headshot and quickly receive likely matches along with biographic information including the person’s name, race, date of birth, and information on their criminal record. Amazon brags that Rekognition’s facial database includes tens of millions of faces, though it remains unclear how that came to be the case. Whatever the reason may be, the result translates to police, using Amazon’s AI-powered facial recognition system, to potentially track anyone — not just the suspects in a particular criminal case.